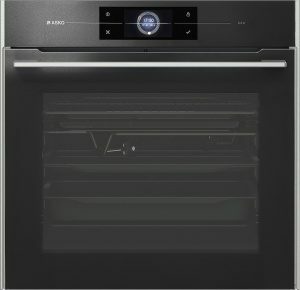 Every component of the ASKO OP8678G Pyrolytic Multi-Functional Oven is manufactured using precision technology and first class materials. Only the best stainless steel and ceramic glass is used, while cast iron supports and rich detailing result in a robust and attractive oven. Pyrolytic ovens are the cutting-edge of appliance technology and users are won over, with many people wondering why they tolerated outdated conventional ovens for so long. An ASKO Pyrolytic Multi-Functional oven is perfect for contemporary kitchens where form, function and durability are expected. Australians are becoming familiar with international cuisines, and special dietary choices for health and wellbeing are common. As part of the natural evolution, ASKO oven development is progressively geared toward the needs of modern consumers, where form and multi-functionality work hand in hand to create a harmonious living and work space. Convenient cooking is easy with an ASKO OP8678G Pyrolytic Multi-Functional oven that helps plan menus and methods, automatically calibrates oven settings according to user choices, and even stores favourite recipes for easy retrieval at a later date. Elements by ASKO includes the sophisticated oven range, where timeless Scandinavian design qualities are enhanced by progressive manufacturing and technology. These ovens are specially created to be attractive and hard-wearing kitchen helpers that continue looking good and functioning seamlessly for many years. The clean lines, smooth finish and minimalist approach to modern kitchen design is superbly complemented by ASKO multi-functional ovens that introduce the entire family to new ways of preparing and cooking meals. · Extra-large oven cavity, including 5 baking levels, to ensure all unexpected food cravings are satisfied and catering tasks are easily accomplished. When maintained properly, top range appliances last for many years. ASKO pyrolytic ovens incorporate both pyrolytic and steam cleaning programs into oven design, taking guesswork out of the cleaning equation. Pyrolytic cleaning is thorough, leaving nothing but ash to brush away once the cleaning process is complete. Pyrolytic cleaning performed approximately once per month, depending on oven usage, will ensure the oven always looks and functions great. Pyrolytic cleaning is inexpensive compared to old fashioned scrubbing and scraping methods using harsh cleaning solutions, rubber gloves and lots of elbow grease. Kitchen innovations that simplify cooking, save time, and deliver delicious results are guaranteed winners, and the ASKO OP8678G Pyrolytic Multi-Functional Oven incorporates the best technological innovations for quality, convenience and full satisfaction.